Catalase is the name of an enzyme. This enzyme is nearly present in all living plants and animals which are always exposed to oxygen. Catalase enzyme is also present in aerobic and facultative anaerobic micro-organisms. Generally, this micro-organisms utilise oxygen and produce hydrogen peroxide and this hydrogen peroxide is toxic to the cells and it affects the cells enzyme system so to avoid this toxic effect micro-organism produces catalase enzyme. The role of catalase enzyme is to convert hydrogen peroxide molecule to water and oxygen and this reaction is an irreversible reaction. It is also one of the reasons that anaerobic micro-organisms do not survive in presence of oxygen as hydrogen peroxide is produced and due to lack of catalase enzyme this hydrogen peroxide destroy cells enzyme system and the cell dies. Why is it important to carry out a Catalase test? The purpose of carrying out a catalase test is to detect the production of catalase enzyme by bacteria. Secondly, catalase test helps us to determine whether the micro-organisms are aerobic, anaerobic or obligate anaerobic in nature and due to this we can differentiate the organisms in catalase positive or catalase negative group. This differentiation helps us in the identification and classification of bacteria. 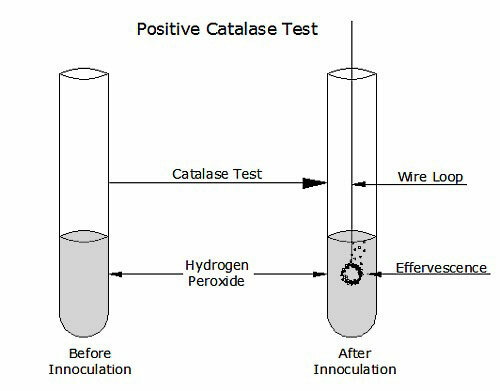 How is the Catalase test performed? The Catalase test can be performed by using two methods. 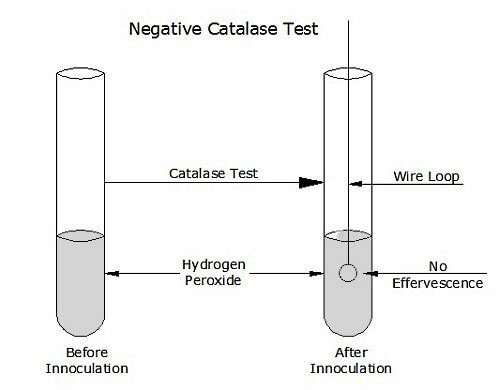 In the test tube method, the catalase test is performed in a sterile test tube. The aim of the experiment is to carry out the catalase test by tube method. A sterile test tube is taken and with the help of a dropper 5 to 6 drops of hydrogen peroxide are added. This procedure is carried out under sterile conditions. Further, with the help of a sterile nichrome wire loop, a colony of a test culture is picked up and inserted in hydrogen peroxide containing test tube. The test tube is observed for the production of effervescence that is bubble formation this reaction occurs immediately after the addition of culture. If effervescence is observed, test culture is catalase positive and if their are no effervescence test culture shows negative catalase test. The aim of the experiment is to carry out the Catalase test by Slide method. Take a clean grease free slide and on it take a drop of sterile water and with the help of a sterile nichrome wire-loop pick a colony of a test culture. Further with the with the help of a dropper add 3 to 4 drops of hydrogen peroxide all this procedure should be carried in a sterile condition. After the addition of hydrogen peroxide, the slide is observed for formation of effervescence that is bubbles. If effervescence is observed within 20 seconds then the catalase test is positive and if effervescence is not observed when the catalase test is negative. List of some Catalase positive micro-organism. How is IMViC Biochemical test performed ?